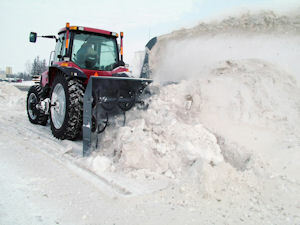 The I Series, part of the SnowLogix line of snow blowers, includes four models of industrial-duty, tractor-mounted units — available in 9- and 10-ft. widths for efficiently moving large amounts of snow. Engineered for large tractors with tall tires, all models in the I Series offer a two-stage design, with 16-in.-diameter augers and extra-large, 36-in.-diameter fans. Maintenance is kept simple with easy-access shear bolts, extra-large skid shoes and a bolt-on cutting edge.